Posted January 9, 2017 by Josette Farrell in News. 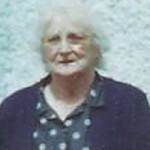 Josephine O’Dea, (nee Costello) Kiltrogue, Claregalway, Co Galway; January 8th 2017; (Peacefully at her home, surrounded by her loving family); Predeacesed by her husband Michael and daughter-in-law Peggy; Sadly missed by her loving daughters, Mary (Kirwan), Freda (Morrissey), Teresa (Kilgarriff) and Bernie (Hession), sons Dermot, Richard, Gerard, Michael John and Martin, daughters-in-law, sons-in-law, grandchildren, great-grandchildren, brother Paddy and his wife Bridie, nephews, nieces, relatives, neighbours and friends. Remains reposing at Lackagh Mortuary Chapel on Tuesday evening from 5pm with Removal at 7pm to the Church of our Lady of Knock, Lackagh. 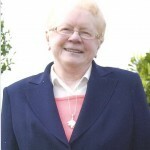 Funeral Mass on Wednesday at 11am with burial afterwards in Lackagh Old Cemetery.